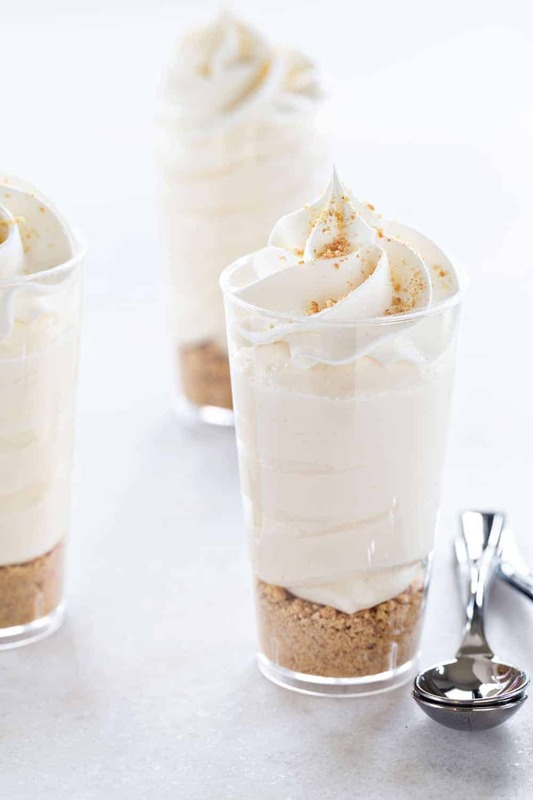 RumChata Cheesecake Pudding Shots come together with 5 simple ingredients. They’re sweet, delicious and perfect for any grown up party! Do you have signature dishes that you take to pretty much any festivity? I totally do. If someone asks for a side dish, I’m bringing my Greek pasta salad. For dessert, it’s either my favorite chocolate chip cookies, or cheesecake. But lately, I’ve been all about these RumChata Cheesecake Pudding Shots. My obsession with these pudding shots started back in the fall when Brittany Gibbons posted about them on either Facebook or Instagram. Side note, if you don’t follow Brittany, you definitely should. She’s hilarious and pretty much all around amazing and hello, she’s a New York Times Best Selling Author! Let’s not forget that she also brought these delish RumChata Cheesecake Pudding Shots into my life. I first whipped them up to pass out to parents during Trick-Or-Treat, complete with mini spoons. Yes, we live in that type of neighborhood. And let’s just say they were pretty well received. People pass out everything from hot cocoa and wine to spiked spiced apple cider. Some might think we’re a little extra, but we’re the ones on the block handing out pudding shots, bags of Ballreich chips and full-size candy bars. As you can imagine, our driveway is a pretty hopping place! Since I started making these, people are always so curious about RumChata. 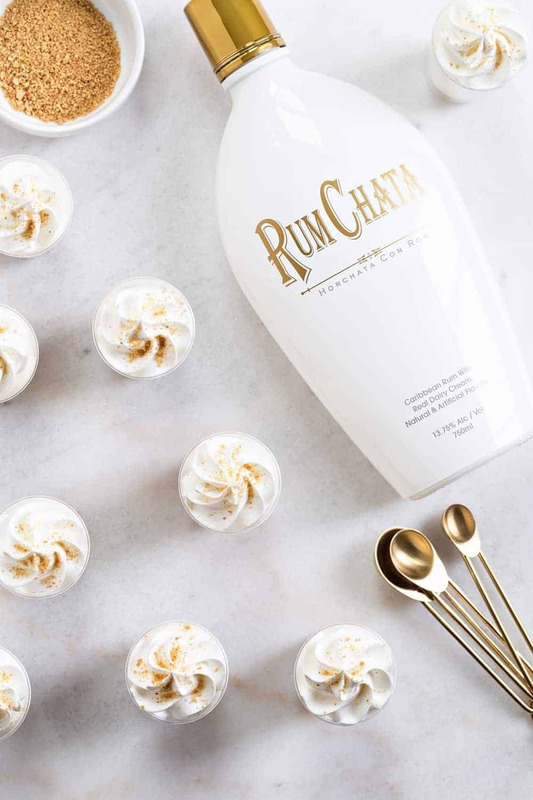 According to their site, RumChata is bottled from a made-from scratch cream liqueur recipe that uses five times distilled Caribbean rum and the freshest real dairy cream with a touch of natural cinnamon, vanilla, sugar and other secret flavors. I mean, how could that not be delicious? 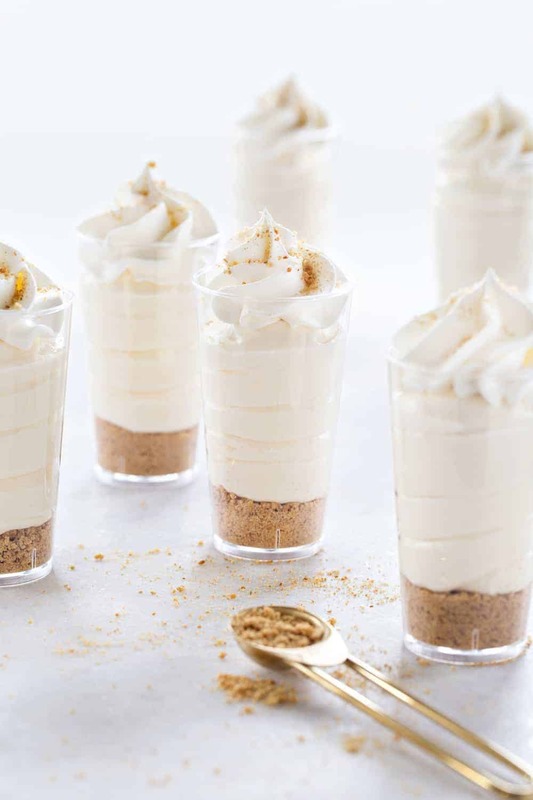 Ever since Halloween, I’ve made these RumChata Cheesecake Pudding Shots for just about every occasion. From girl’s night out to Christmas Eve, they’ve become my signature boozy dessert. And let’s be honest here, they are so much better than any jiggly Jell-o shot that I’ve ever had. 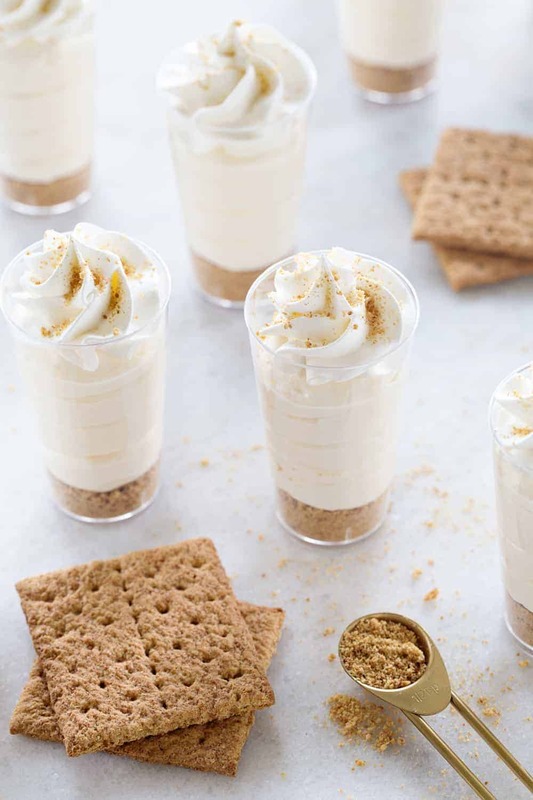 With layers of cinnamon graham crackers, smooth RumChata infused cheesecake pudding, and creamy whipped topping, these pudding shots are going to be your new favorite dessert shooter. 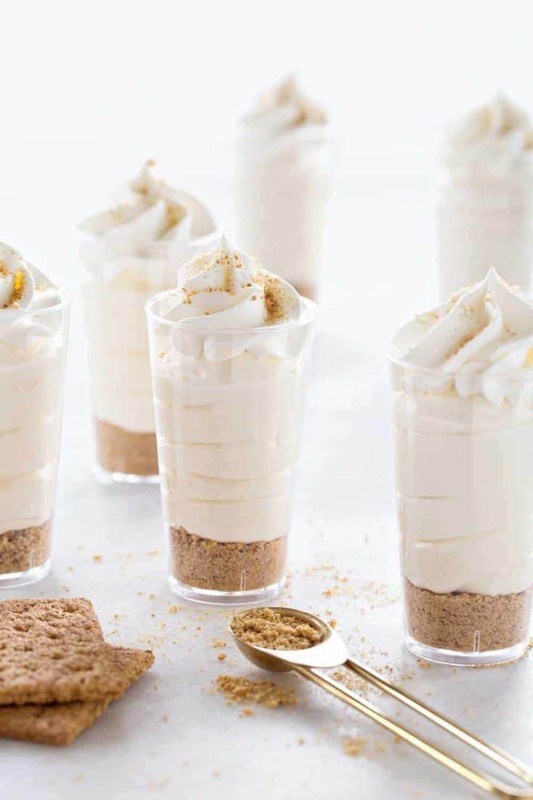 Not only are these pudding shots a delicious crowd favorite, they are so simple to make. From start to finish, you’re looking at less than 10 minutes. You really only need a handful of ingredients: graham crackers (which are totally optional), a small box of pudding, milk, RumChata, and whipped topping. I love the addition of the crunchy graham cracker crust. 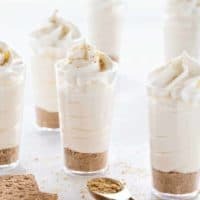 And I find that cinnamon graham crackers are particularly amazing in these RumChata Cheesecake Pudding shots, but you can definitely omit them if you want. I personally prefer cheesecake flavored pudding, because cheesecake, duh. But you can use vanilla, banana and even white chocolate pudding if it strikes your fancy. Can you tell I’ve tested my fair share of pudding shots? If I’m hosting a party at our house, I’ll serve these pudding shots up in mini dessert shot glasses. But for occasions like Trick-Or-Treat or girl’s night out, I typically use plastic souffle cups with lids, or plastic shot glasses, like the ones in these photos. They’re simple to transport and I don’t have to worry about tracking down my glass dessert shot glasses from other people’s houses. You can even pick up mini plastic spoons that are perfect for spooning up all that pudding shot goodness. 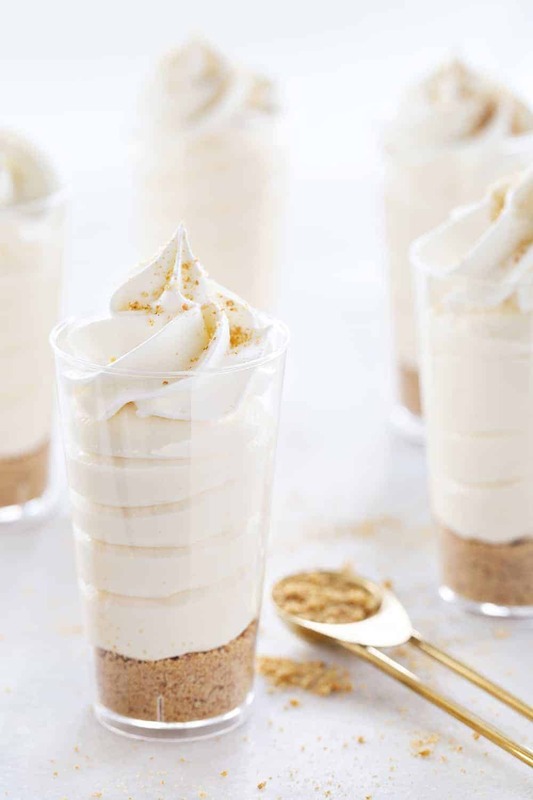 Another great thing about these RumChata Cheesecake Pudding Shots is that they are totally adaptable. Use different combinations of cookies, pudding flavors and liqueurs. I’m testing a strawberries and creme version right now that it freaking amazing. So stay tuned for that one. Where will you serve your pudding shots? Tell me about it! I’m always looking for new ways to entertain. 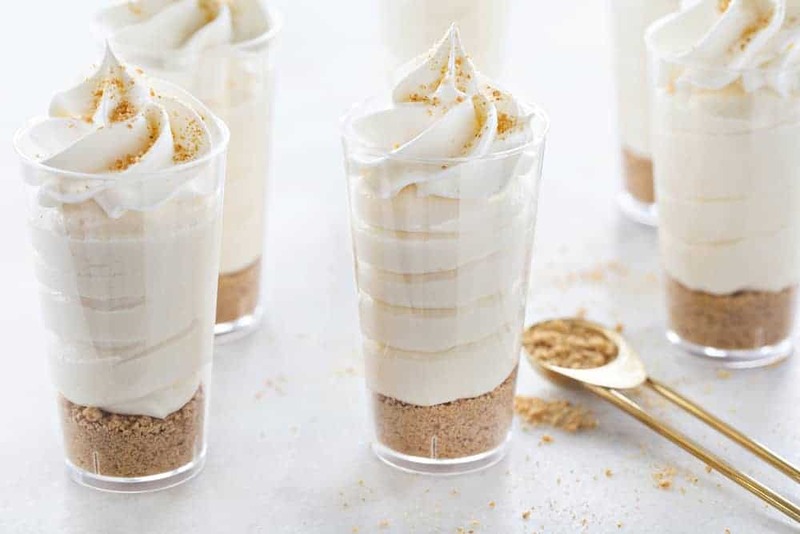 Evenly divide the graham cracker crumbs between 16 plastic shot glasses, or souffle cups. In a large bowl, whisk together the milk, Rumchata, and pudding mix. Continuing whisking for about 2 minutes. Place the bowl into the refrigerator and allow it to set up for about 5 minutes. Remove the bowl from the refrigerator and fold in the Cool Whip. 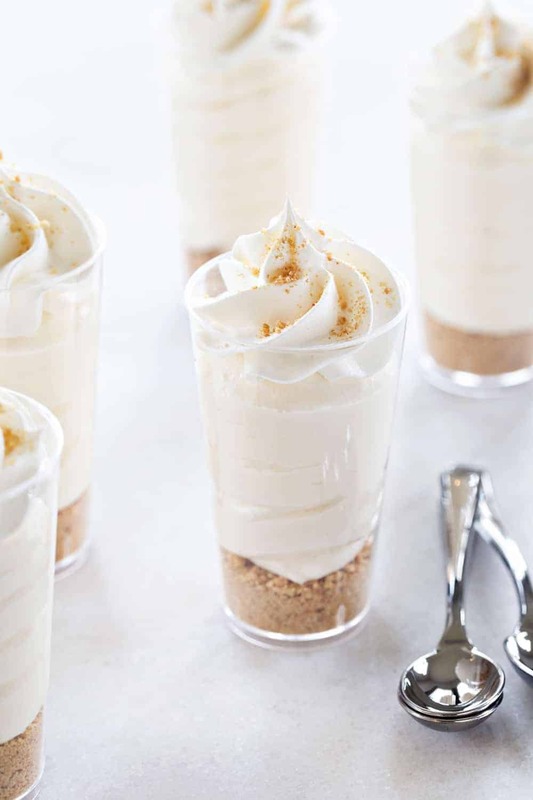 Pipe or spoon the RumChata cheesecake pudding into each of the cups. When you're ready to serve them up, top them additional Cool Whip and graham cracker crumbs if desired. RumChata can be find at liquor stores and even places like Target and grocery stores. I prefer using whole milk or 2% milk in this recipe. Hello, lover! These would be fun as a brunch dessert … maybe with Cinnamon Toast Crunch crumbled at the bottom! I love this idea, Elizabeth! Thanks so much for stopping by! Can you use the pre made cheese cake filling that is available in the grocery store? Hello, Rosemary! I’m honestly not sure what the consistency is for this product, so I can’t really tell you if you can use it or not. These pudding shots look absolutely amazing and perfect for hosting! Thanks for stopping by, Natalie! Have a great day! I can’t believe that anyone would make this with these artificial ingredients. It sounds delicious so why not use real ingredients. Whip cream not cool whip, make your own pudding with cream cheese, not a mix. why waste time making something that adds more un natural ingredients into our system when it could be so much more “natural” with a tiny bit more work. Just my opinion, but, from my point of view there is already too many additives in our food chain , that we can’t control, so why deliberately use packaged ingredients when you don’t need to. That is totally doable. There are organic pudding mixes and even “better for you” whipped topping mixes. You can do whatever it is that you want to do to the recipe. That’s kind of the beauty of recipes, most are totally adaptable. Have a great day. What a lovely pudding shots. Cheesecakes always delight me and the way you made this is adorable. Thanks for sharing the ingredients. Pictures are showing how exquisite this is. You explained it beautifully. I am looking forward to make this at home. Thanks you so much! They are too good! Ha! It’s pretty epic, Albert! I hope you love them as much as we do! Hello! I haven’t attempted freezing this recipe, so I am not sure of the result. If you happen to give it a try, I’d love to know how they turned out. Thanks so much for stopping by. Can you use more Rumchata in place of the milk? I make this in a bowl for a friend. She eats it right up and asks for more! Definitely use cheesecake pudding mix! So happy to hear you enjoyed the recipe, Cheryl! Thanks so much for stopping by and leaving your feedback!